Filled with fresh fruit and delicious treats. 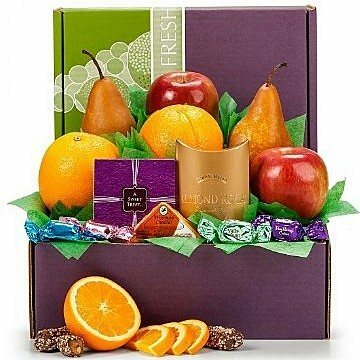 An ideal gift for sending your best wishes for any special occasion, the combination of fresh fruit is always appreciated. Items are individually wrapped and securely packaged in an attractive fruit box. This gift Includes the following: Almond Roca .82 oz, 2 Bosc Pears, 2 California Navel Oranges, 2 NW Fuji Apples, Northwoods Wisconsin Cheddar Cheese 2 oz, and Seattle Chocolate Truffles 1.30 oz. (or Hard Candy Fruit Rods in warmer months .13 oz ea).